Rub a dub dub, Bailey’s in the tub! As I finished giving Bailey his second bath of the day, I thought I might devote this blog to cleanliness. 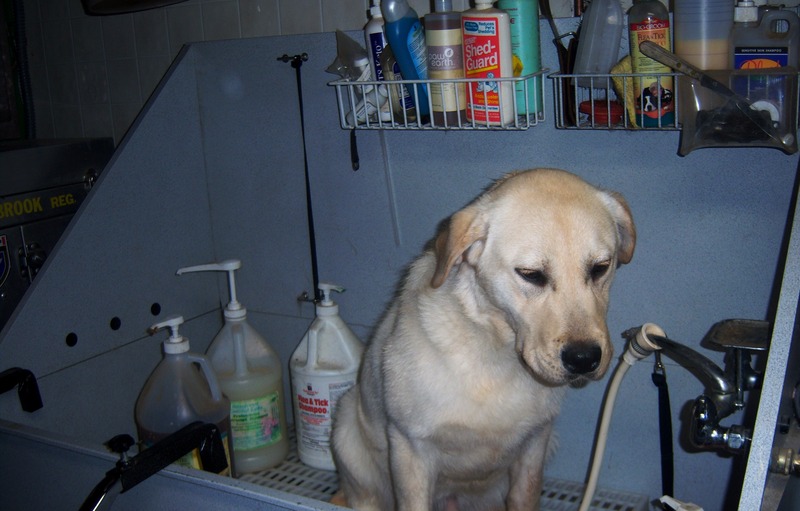 You might be asking yourself why is she bathing her dog twice in one day? Well it all started when Bailey’s 3 Belgium Malinois friends from Tennessee came to visit again. After a long car ride, the Mals were anxious to run, so we took my friend’s Mals and a couple of my Labs and headed for the fenced field we have designated as a dog running area. If you know anything about Belgium Malinois then you know they have tireless energy. My Labs have never experienced such motion so it was fun to watch the Lab pups try to keep up with the Mals. Days before their arrival we had combinations of snow and rain which was now melting and making the field look more like a bog which was slowly becoming more of a mud wallow as forty dog paws churned things up. It didn’t appear that bad with all the brown dogs but poor Bailey looked horrible with clumps of mud and goop all over his pretty yellow fur. After everyone left Bailey got to visit the dog wash tub. Now the decision was which shampoo to use? There are puppy shampoos, Natural herbal shampoos, Brightness shampoos, Allergen reducing shampoos and color enhancing shampoos, even a special one developed by a friend and fellow Lab breeder Gigi Strauss called Rainforest Coastal Labs Hydrocept Shampoo. I didn’t know much about the differences between the shampoos until I talked to her husband who helped to formulate their product line. One of the main ingredients in shampoos is a powerful grease cutting detergent called Sodium lauryl sulfate of SLS. When you see this ingredient on the bottle you can bet the shampoo will give a lot of lather too. Well there are other ways to get that dog clean without using such strong detergents. Bailey was going to a dog show in 2 days so I needed his coat to look its best. With Gigi’s shampoo they use all natural triglycerides and fatty acids that help to restore the skin barrier against allergens, bacteria and dirt while at the same time replenishing and rejuvenating the coat. The shampoo costs a bit more because they also use premium botanical oils and polysaccharides which I was told are to leave your dog clean and fresh smelling and make the skin soft and supple. So Mr. Bailey got wetted down and on went the shampoo, starting from the neck and working back to the tail. The water was brown with all that caked on mud but the shampoo did the trick and before long I had a lovely yellow Labrador puppy once again. No doubt, Bailey’s favorite part was the massaging of the shampoo into his coat. He tired to lean against me and moaned soft puppy moans of ecstasy. Next came a very thorough rinse until every bit of the shampoo and mud residue were gone. Mr. Bailey’s least favorite part of the bath, he will tell you, is the session with the blow dryer. For my dogs I use a professional high powered “Force” dryer that does not heat up, rather it forces the moisture from the coat by high powered channeled air. It is noisy and it feels funny which is why most dogs don’t like it. Bailey did OK though and after a while seemed to not mind at all. After all he was getting attention, and that is something he will tell you he never gets enough of around this house. I thought since he was clean I would put him out with his sister Sage who was in a cement run with a small part of graveled yard; I figured that way he would be able to stay clean for the dog show. You would think after all they years and all the dogs I had I would have known better to make that assumption. They were not together for a hour when I happen to walk by the yard and saw to my dismay, a thoroughly filthy dirty yellow Labrador. “Bailey! What did you do?” I shrieked. Who me? He said with his big soulful eyes, grinning from ear to ear and tail wagging the whole time. And of course you guessed it, Sage did not have a of speck dirt on her anywhere. So this is where the second bath came in. By using the gentle shampoo with no SLS or other sulfates in it you can actually get away with two baths in one day without ruining the natural oil and pH of the dog’s coat and hide. People often ask me how often should you bath your service dog? I think every week; as these dogs are allowed to go where others cannot, we should not give the non doggy loving public anything to gripe about. This is where it becomes important to know a little about shampoos and to have some good ones on hand. I realize that buying a variety of shampoos can make a dent in your budget so many years ago when I was working with a holistic veterinarian learning about homeopathic therapies she taught me how to make my own natural cleaning shampoo. I take a quart jar or bottle, add enough Murphy Oil Soap to fill just under half. Add one half cup of Aloe Vera gel, one eight cup of witch hazel, 2 table spoons of vitamin e oil, and several drops your favorite oil essence, like rosemary or lavender or citrus if you want to repel fleas and bugs. Fill the remainder of the jar with water and mix well. This inexpensive shampoo can be used as often as you like and it leaves your dog shining and clean with a lovely after smell. Like all shampoos please be careful not to get in your dog’s eyes or ears. In case you are wondering, 7 month old Bailey did managed to stay clean for the dog show.